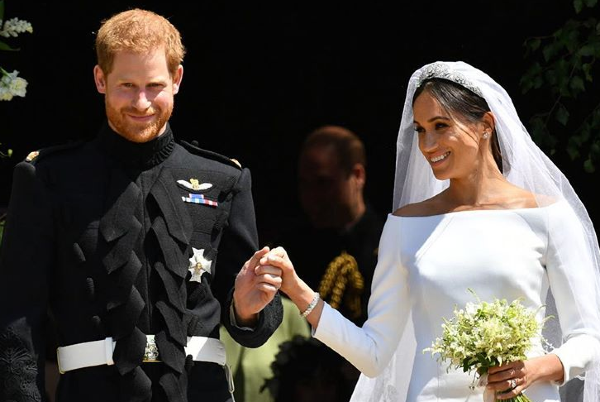 HomeTagsPosts tagged with "royal wedding"
Meghan and Harry’s wedding was one of the biggest events of the year with the momentous occasion reportedly costing an eye-watering £32 million. The Royals certainly went all out for their big day, especially Meghan who spent an extortionate amount of money on her hair and makeup. The Duchess of Sussex looked as classy as ever on her wedding day with a simple updo and natural makeup look. However, despite the understated look, the former Suits actress forked out a reported £10,000 on her hair and makeup. 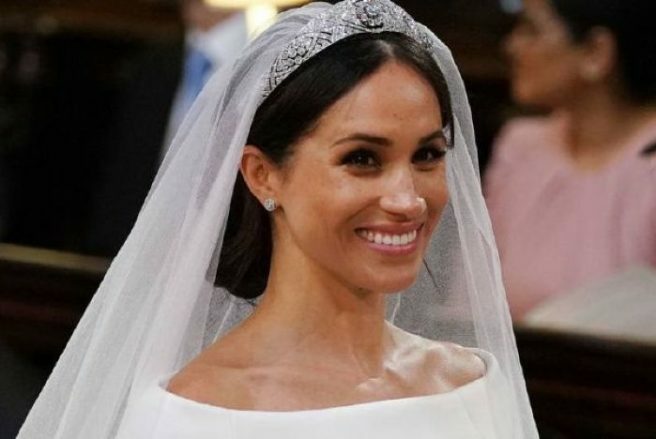 It is believed Meghan’s hair and makeup team spent a mere 45 minutes on her wedding look. 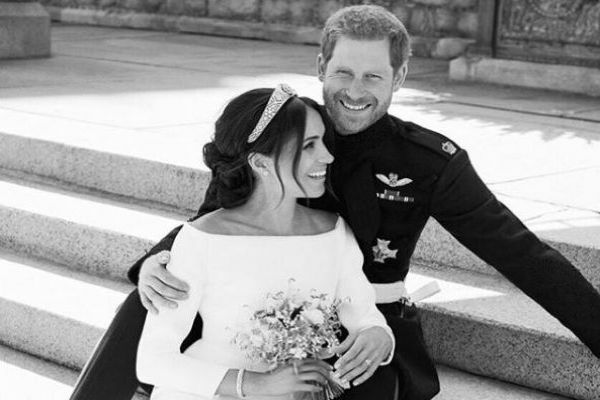 Serge Normant was the man behind Meghan’s chic updo and Daniel Martin worked his makeup magic on Meghan for the big day. Speaking of the special moment, Normant told Glamour that Meghan was extremely relaxed during the entire process. “We talked together a little bit before, but we wanted something that would have an easy feel to it. [It] wasn't a huge process. We wanted it to be something that was right for the day and that felt right for her mostly." 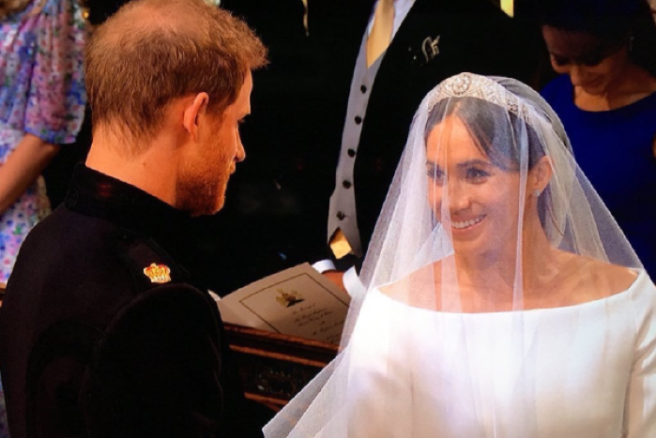 The Duchess looked breathtakingly beautiful on her wedding day, stealing the hearts of the millions who tuned in to watch her and Prince Harry tie the knot at St. George’s Chapel on May 19. However, we can’t quite believe just how much she spent on her hair and makeup alone. We won’t feel half as guilty the next time we splurge on lipstick from Charlotte Tilbury. 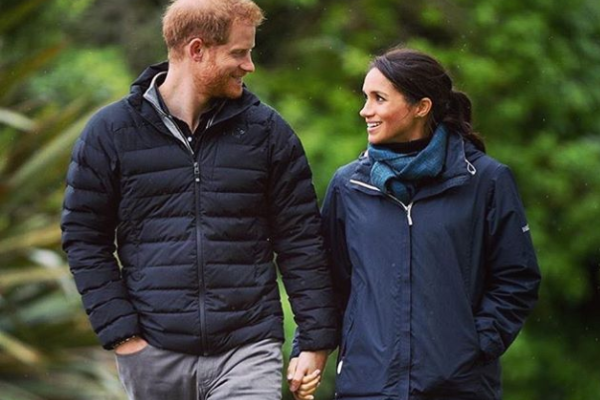 The Duke and Duchess of Sussex have released their first official Christmas card as a married couple and it is just as romantic as we imagined. The lovebirds decided to use a photo from their May wedding for their Christmas card and it is truly beautiful. Kensington Palace shared the stunning snap with fans of Meghan and Harry this morning. They wrote: "The Duke and Duchess of Sussex are delighted to share a new photograph from their Wedding Reception at Frogmore House on 19th May. "The photograph, which features on Their Royal Highnesses’ Christmas card, was taken by photographer Chris Allerton." The black and white photo shows the Duke and Duchess gazing at a firework display on the night of their wedding. It is beyond romantic. 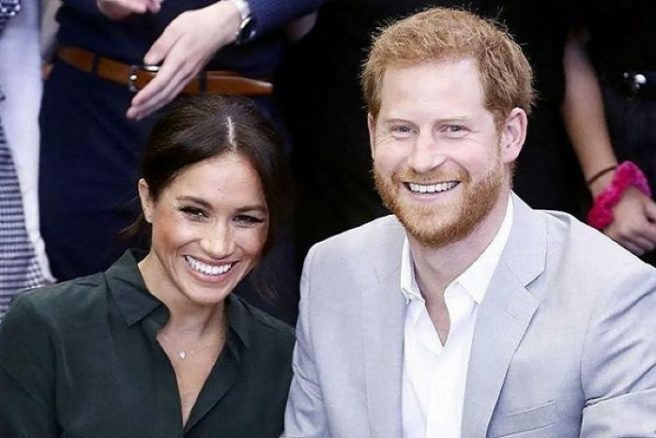 2018 has been quite the year for Harry and Meghan with the pair tying the knot AND confirming they are expecting their first child together in the past few months. The parents-to-be will be celebrating many milestones in the New Year as they prepare to welcome their baby boy or girl as well as moving into Frogmore Cottage. The Sussexes have really stolen the hearts' of the nation with their love story. There's no doubt they are going to have the most special Christmas. The Duke and Duchess of Sussex have been busier than ever since their wedding in May. It was the day they made their eternal vows and allowed themselves to be caught up in their very own love bubble. After deciding on the basics like the venue and the dress, the bride-to-be was faced with choosing her wedding tiara. She remembered that day, saying that her number one priority was finding a piece that complemented her timeless Givenchy dress. But she could not make the decision without her devoted partner, Prince Harry. According to People, a new exhibition at Windsor castle called “A Royal Wedding: The Duke and Duchess of Sussex” tells the behind-the-scenes story of the royals’ big day. “Harry and I had gone to Buckingham Palace to meet with Her Majesty The Queen to select one of the options that were there, which was an incredibly surreal day as you can imagine,” said Meghan’s recorded voice. Both her and Harry decided on the gorgeous art deco style bandeau tiara. The diamond bandeau is an English style and was made in 1932, with the entire brooch dating from 1893, said Kensington Palace. Prince Harry called the tiara “every girl’s dream”. "Funnily enough, it was the one that suited the best, the one that looked the best on you without question," he said. "I shouldn't have really been there – but an incredible loan by my grandmother. Very sweet." How special that the two were able to choose one of his grandmother’s treasured tiaras together. Princess Eugenie has shared a never-before-seen wedding snap and our hearts just can’t cope. The gorgeous bride and husband Jack cuddled their bridesmaids and page boys in the beautiful shot that was taken at Kensington Palace. The photo was taken by British photographer Alex Bramall. He said it was an “honour and a privilege" to capture Eugenie and Jack’s special day on camera. The lovebirds tied the knot on Friday, October 12. The star-studded wedding ceremony took place at St. George’s Chapel on the grounds of Windsor Castle. The pair shared a kiss on the steps of St. George’s Chapel after their touching ceremony. The wedding was like something out of a fairytale. The groom couldn’t even hold back his tears when his darling wife entered the church. Jack sobbed as Eugenie was escorted up the aisle by her dad the Duke of York. Apparently, Jack said: “Oh… my heart… Oh, break my heart,” as Eugenie walked up the aisle. Eugenie and Jack exchanged vows in front of celebrity friends and members of the royal family. Queen Elizabeth II and husband Prince Philip were in attendance, as well as the Duke and Duchess of Cambridge, the Duke and Duchess of Sussex, Prince Charles and a host of celebrities. Talk about relationship goals, am I right? 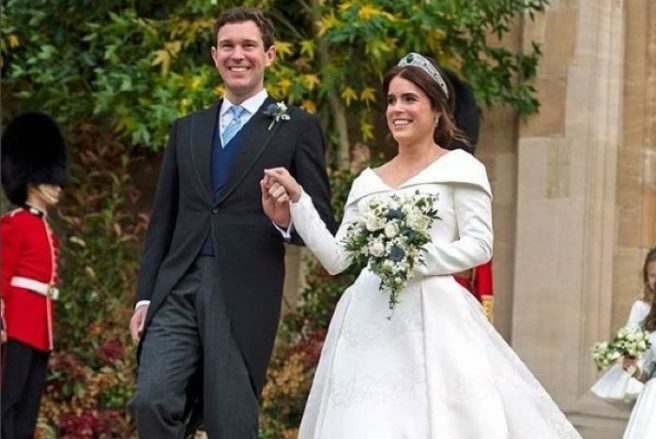 Guests from all over the world turned up to show their support for Princess Eugenie and Jack Brooksbank’s wedding. Alongside the royal family came Demi Moore, Liv Tyler, Pippa Middleton, Robbie Williams, Stephen Fry, and so many more. Most of the people in attendance adhered to the royals’ dress code – day dresses and tailcoats. Cara has been the talk of the royal wedding. She looked captivating in her sleek suit and top hat. Her skinny tie and fitted look was a chic choice, and paired with black heels, her look broke the rules in the best way. Shown on the right, the youngest daughter of the Duke of Northumberland had no problem making a statement of the fashion variety. Her powdered blue jumpsuit strikingly stood out from the sea of autumn coloured dresses around her. Singer Ellie Goulding wore a silver, Kimono-styled dress with a vintage ruffle along the bottom. Its stiff collar and flared sleeves, along with the sparkling, Christmas colour, set apart her dress from the rest of the guests. The Duchess of York found the perfect accessory to match her fun and dynamic personality for her daughter’s wedding. Her matching emerald hat had gorgeous gold detail that stiffly stuck out from both sides. Prince Harry’s ex still remains close to the family and looked beautiful in her royal blue ensemble.The velour piece featured navy vine designs across it and was paired with an adorable matching headband. All of the women wore their quirky fashion pieces with confidence and looked stunning in their trendy debuts. Sarah Ferguson arrived at St George's Chapel to witness her youngest daughter Princess Eugenie marry her fiancé and long-time boyfriend Jack Brooksbank. Wearing an emerald green dress which show-cased her glamour, the Duchess of York donned an amusing green hat as she climbed the chapel stairs. The dress was made by local Ascot dress maker Emma Louise Design. It seems to be the hat that’s gaining more attention than the dress, for once. It would be more suited to Hogwarts than Windsor Castle tbh. 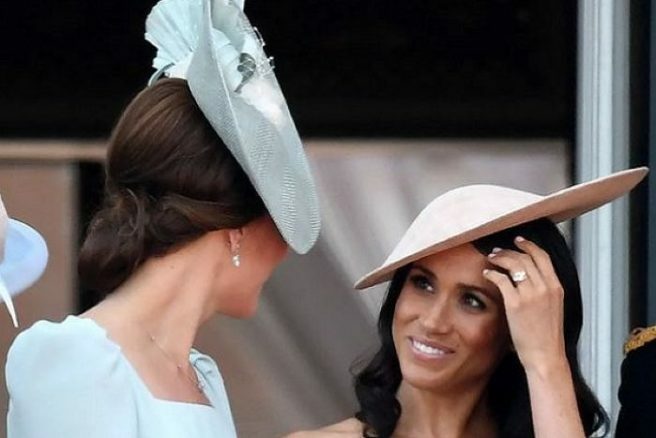 The hat was nearly blown away in the wind as she attended the wedding, but the wings probably would have carried it to safety, or else strategically landed on Princess Eugenie’s head to get the best view of the wedding. Who knows, maybe two teams of Quidditch players would have chased it around the grounds on broomsticks? Ferguson may even be showing her Harry Potter house colours, who would have thought she’d be Team Slytherin? The mother of the bride was joined by eldest daughter and maid of honour Princess Beatrice, who wore blue. 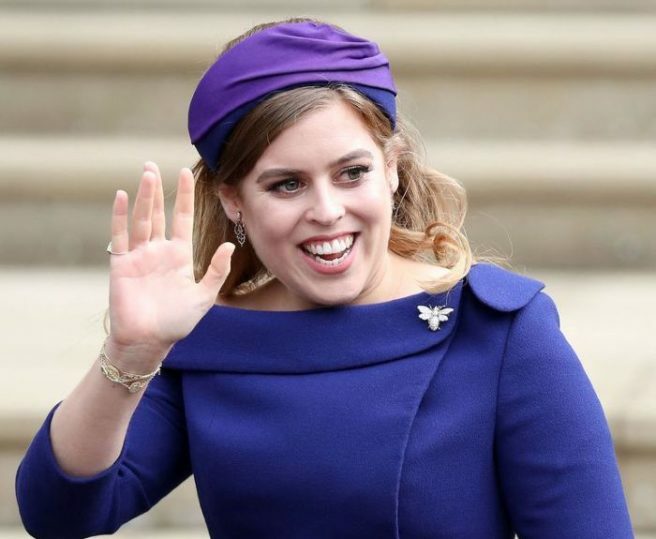 Princess Beatrice, elder sister and Maid of Honour to Princess Eugenie, has broken a slight tradition with her outfit for the royal wedding and opted for an outfit of colour, after some experts expected her to wear a more pastel colour in line with the bride, as Pippa Middleton did to sister Kate's marriage to Prince William. And she also opted to arrive with her mother, rather than the bride as was expected. She arrived at St. George's Chapel in Windsor alongside her mother, Sarah Ferguson, the Duchess of York, wearing a boatneck-style Ralph & Russo dress, which was a vibrant royal blue. It was accompanied by a simple purple fascinator. Eugenie's wedding dress code was quite strict (men had to wear morning coats and women day dresses), and Beatrice followed the rules to a T by perfectly matching her fascinator to her dress (as the royals do) and a pair of heels. Her style for the day, was fittingly, more demure than on previous occasions so that her sister would take centre stage. A Maid of Honour isn't quite as big a tradition in Britain as it is here or in the US, but the royal family confirmed that Beatrice would take the role by sharing a sweet family snap of the two sisters on social media. The elder sibling was also notably there as a support to her mother, who though no longer officially in the royal family, naturally played a key part in the wedding. Despite the Duke and Duchess or York separating many years ago, they still live together and are frequently seen out at public events supporting both their daughters. The big day has finally arrived for the Royals, and the bride has made her appearance. Princess Eugenie made her entrance at St. George’s Chapel looking incredible in a Peter Pilotto gown. The dress was designed by both Peter Pilotto and Christopher de Vos, and it has buckled the minimalist trend that other Royals have opted for. Eugenie is wearing the stunning Greville Emerald Kokoshnik tiara, also known as the Boucheron tiara. 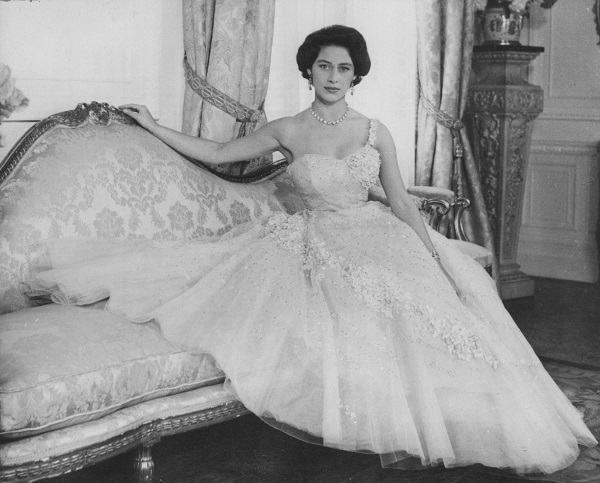 The gorgeous piece of jewellery once belonged to the Queen Mother, who was left it by Mrs Greville. The 28-year-old opted for her hair to be in an up style by Sonny-Jo Macfarlane at Hari’s and make-up by Bobbi Brown’s Hannah Martin. 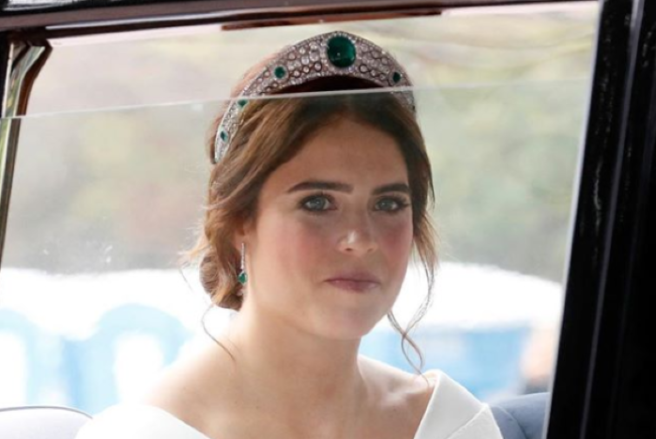 Eugenie accessorised her look by matching the tiara with emerald earrings. The diamond drop earrings are a gift from the groom, Jack Brooksbank. Eugenie’s wedding shoes are by Charlotte Olympia and she carried a bouquet by Patrice van Hellen Oakes. The off-the-shoulder, Peter Pilotto gown beautifully honours her battle with scoliosis. The princess underwent surgery at age 12 for the spinal condition and she bravely chose to embrace her scars on her big day. Jack and Eugenie are now officially man and wife. Guests have started to arrive at Windsor Castle ahead of Princess Eugenie and Jack Brooksbank’s wedding. The lovebirds are set to tie the knot at St. George’s Chapel this morning and it’s safe to say there’s been quite the turnout. A mass amount of celebrities including Demi Moore, Liv Tyler, Kate Moss and Robbie Williams have arrived at the chapel, but the public has been waiting with baited breathe for Kate and Meghan to arrive. The Duchesses arrived at the momentous celebration together with Prince Harry and Prince William by their sides. Meghan dazzled in a navy Givenchy number and a hat by Noel Stewart. Kate looked phenomenal in a pink dress by Alexander McQueen and a Philip Treacy hat. We're sure Meghan and Harry are feeling pretty loved up today considering they said 'I do' at the very same venue in May. Harry and Meghan arrive at Princess Eugenie's wedding, closely followed by the Duke and Duchess of Cambridge. Kate’s sister Pippa Middleton also arrived wearing a stunning emerald green dress that showed off her blooming baby bump. Excitement is growing as the public waits for the beautiful bride to arrive. We are beyond excited to see Princess Eugenie’s dress. There’s no doubt she’s going to look as gorgeous as ever. Excitement has been blowing through the grounds at St. George’s Chapel. 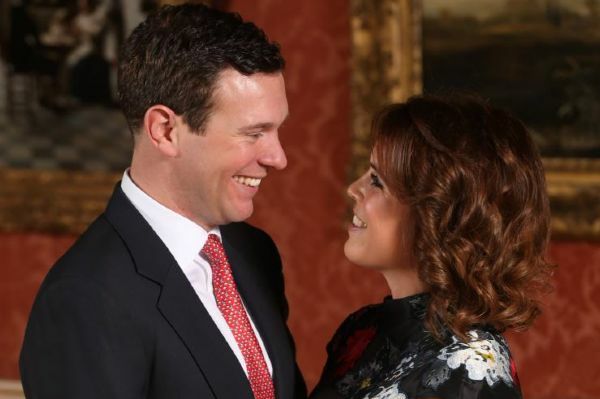 Today marks the special wedding day of Princess Eugenie and Jack Brooksbank. And guests are turning up in crowds, thrilled to see the royal ceremony that marks the lovebirds’ happiness. The happy couple have invited 1,200 members of the public to attend the Windsor wedding as well as family and friends. Now, the guests are filtering in and we have seen some surprising supporters of the royal pair. In attendance are Liv Tyler and Demi Moore, who look absolutely stunning in their maroon and navy fascinators. Robbie Williams also arrived in a sleek, silver suit with a classy combed-back hairstyle. He was seen holding hands with his wife Ayda Field looking more fabulous than ever in her white ruffled suit. Naomi Campbell is also in attendance wearing a gorgeous vintage-styled, black feathered dress as well as Britain's beloved Stephen Fry. Singers Ellie Goulding and James Blunt would not miss the big event either. Among the guests @stephenfry makes his appearance at Princess Eugenie's big day. Other guests include Kate Moss, Prince Harry’s ex Chesly Davy, and of course the Royal Family. How amazing does Cara Delevinge in her suit and top hat! Bob Geldof's daughter Pixie arrived with her husband George Barnett, breaking the sea of classic colours with a baby pink dress and matching twisted wrap. The guests are teeming with joy for the soon-to-be married couple, fighting through blustery winds on their way to the chapel. 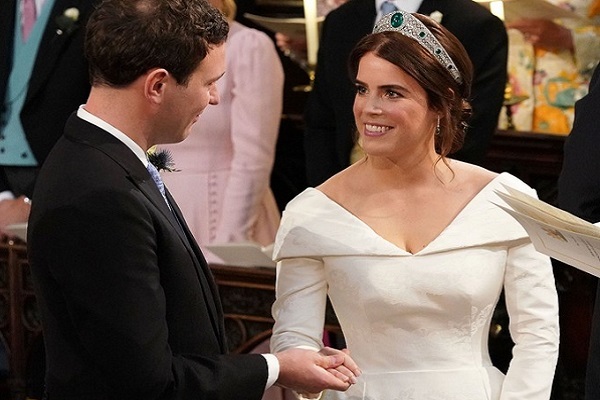 We cannot wait to see what Princess Eugenie’s dress will look like. Prince Harry and Meghan Markle tied the knot in the most magical May wedding this year. Their love story is like something out of a fairytale and we couldn't be more jealous. 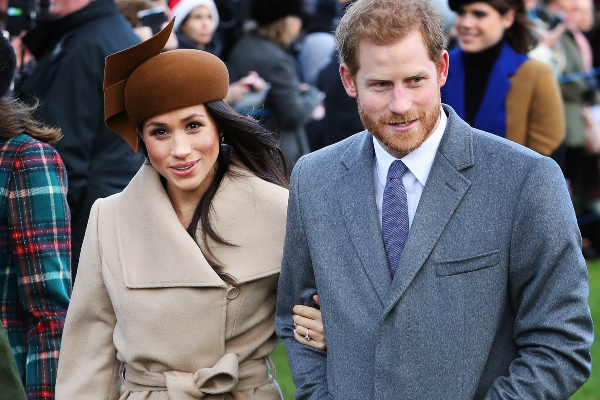 They may be one of the most-loved celebrity couples of the 21st century, but like all of us, former Suits actress Meghan couldn’t help but worry after her first date with the prince. A close friend of the royal couple set them up on a blind date back in 2016. Meghan only had one question to ask about her now-husband when her friend recommended going on a date with him. The couple enjoyed an “intoxicating first date” but Meghan was extremely worried about one thing in particular. 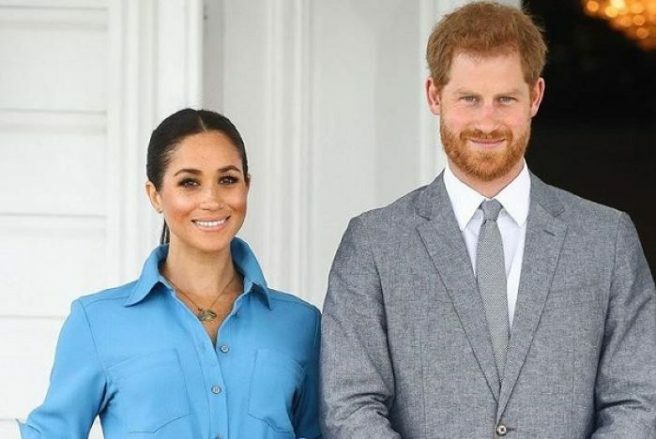 According to royal biographer Andrew Morton, the Duchess of Sussex was afraid she came across as too eager after she agreed to a second date with the prince. Now if only we could find a fella like Prince Harry. We adored every character in The Crown, from Queen Elizabeth herself to the dashing Antony Armstrong Jones. We even had a soft spot for Tommy Lascelles. 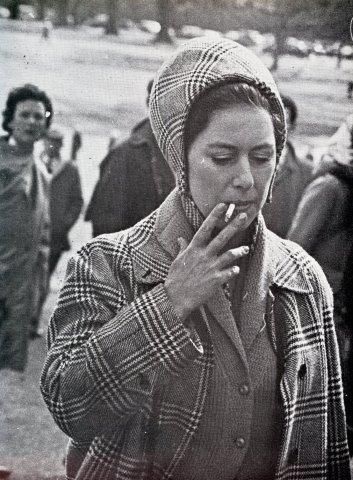 However, there was always one character who stood out from the crowd, the one and only Princess Margaret. Vanessa Kirby dazzled as the rebellious royal during the first two seasons of the show. We were completely captivated by her performance, but what really grabbed our attention was the troubled life of Margaret herself. We were stunned by just how devastating Margaret’s love life was, especially at such a young age. Our hearts ached for her when she was torn apart from Group Captain Peter Townsend. Margaret always felt outshone by her older sister, Queen Elizabeth, and longed to be in the spotlight. The princess will now have her moment, thanks to the BBC. 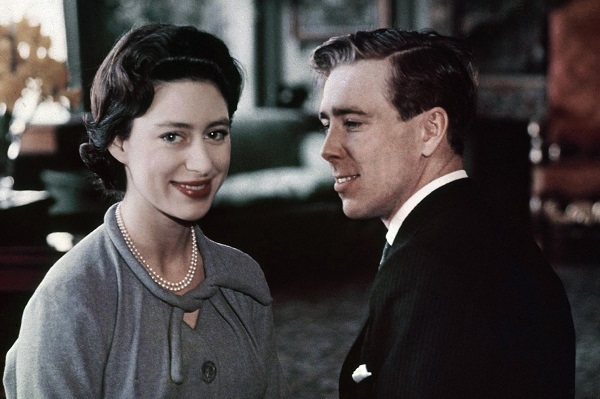 They are producing a two-part documentary series based on the ‘life and loves’ of the monarch’s troubled sister. According to The Telegraph, Vanessa Kirby’s successful performance in The Crown inspired this documentary series. The programme is set to feature interviews with various acquaintances of the late princess, including Basil Charles, who once owned a bar on the island of Mustique, where the princess often holidayed. 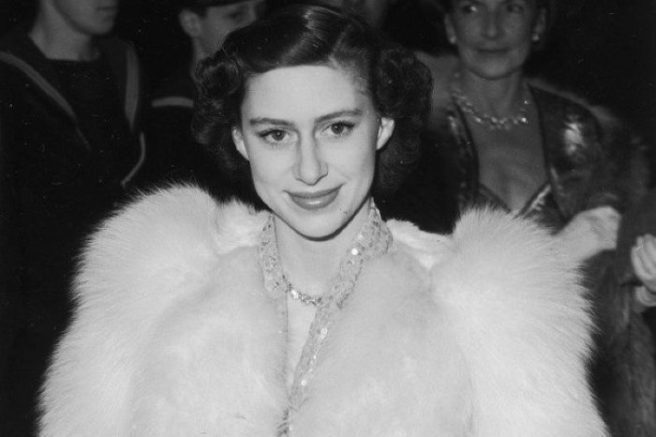 The series will look at her forbidden love, her rebellious ways and her struggle with living in Queen Elizabeth’s shadow.